The Search for Extraterrestrial Intelligence (SETI) is in the news. The biggest recent effort to search for extraterrestrial civilizations is a project called Breakthrough Listen. The project is a ten-year project that began in 2015 with 100 million dollars in funding from a Russian billionaire. A few days ago, the project announced what it had found so far. A few web sites made it sound as if something very interesting had been found. The Daily Star site had a headline: “Alien shock as scientists reveal 11 mysterious ‘signals’ hailing Earth are probed for UFOs.” The web site sputniknews.com had a headline, “SETI's Largest Project Reveals That 11 Signals From Space May Point to Aliens." But when you actually read the release, you will hear about nothing indicating success. The 11 signals are simply the “highest ranked” in terms of strangeness. The press release concedes that “the search has not yet detected a convincing signal from extraterrestrial intelligence.” The press release gives us no details of any one of these “highest ranked” signals, which suggests that none of them is particularly interesting. They are probably just emissions from natural phenomena or from earthly sources. We found no such laser emission coming from the planetary region around any of the 5600 stars. As they contain roughly 2000 lukewarm, Earth-size planets, we rule out models of the Milky Way in which over 0.1% of warm, Earth-size planets harbor technological civilizations that, intentionally or not, are beaming optical lasers toward us. A previous scientific paper reported on a search for optical signals coming from sun-like stars. 10,000 such stars were searched over the course of two years, but no such signal was found. Extensive searches looking for radio signals from extraterrestrials have also come up negative. This paper describes a negative search for alien radio signals coming from 9293 stars, consisting of 19,000 hours of observations carried out between May 2009 and December 2015. Another search for extraterrestrials looked for signs of large-scale engineering in distant galaxies. Since the universe is about 13 billion years old, if an extraterrestrial civilizations had appeared on a distant planet, it would be more likely to have appeared billions or millions of years ago. Such a civilization might have evolved into some state of godlike power, allowing it to re-engineer entire solar systems or entire galaxies. But a search of 100,000 nearby galaxies looking for signs of extraterrestrial engineering came up empty. When I was a young man in my early twenties, Carl Sagan was at the height of his influence, and I bought quite a few of these ideas. But now quite a few of these ideas seem dubious or untenable. 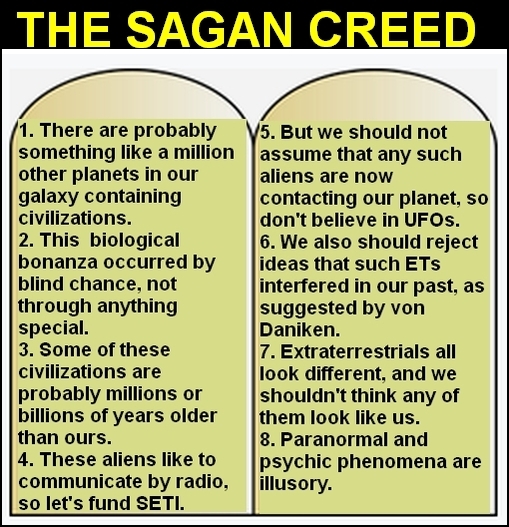 As a whole, the Sagan Creed lacks coherence, and parts of it seem to contradict other parts of it. For example, if it were true that the galaxy was teeming with so many extraterrestrial civilizations, why should we not expect that some of them are visiting us now, or have visited us in the past? Oddly, Sagan himself wrote a book briefly hinting that some archaeological evidence suggested extraterrestrial visits in the past, but then began denouncing that idea when it was vigorously advanced by Erich von Daniken. Was he jealous that von Daniken's books advancing the idea made many times more money than Sagan's own book briefly suggesting the same idea? Another inconsistent part of the Sagan Creed is its insistence that extraterrestrial intelligence is very common, but that mere blind chance is all that is at work to produce extraterrestrial life and extraterrestrial intelligence. Given all the great difficulties in life appearing by chance (discussed here), and the equally great difficulties of intelligence appearing by chance, we should not expect that extraterrestrial intelligence should be common if nothing special is at work in the galaxy, and that just blind chance is at work. But one has a consistent position if you maintain either (1) that some great force of cosmic teleology is at work, and that intelligent life has commonly appeared, or (2) that nothing but blind chance is involved, and that intelligent life is incredibly rare, requiring extremely improbable accidents. Another inconsistent part of the Sagan Creed was its assumption that extraterrestrial civilizations would be using radio for communication, matched with the claim that such civilizations are probably millions of years older than ours. If such civilizations were so advanced, should we not assume that eons ago they switched to something far more advanced than radio communications? 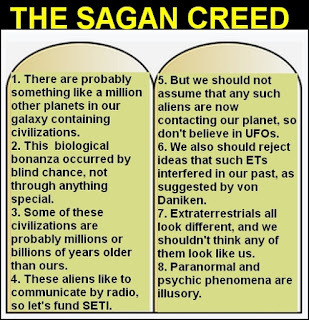 Another inconsistent part of the Sagan Creed was his repeated insistence on both the claim that extraterrestrial life is very common, and that extraterrestrials would never look anything like humans. He justified the idea that extraterrestrials would never look like humans on the grounds that there are trillions of possible paths evolution might make. But the same reasoning can be used to argue that extraterrestrial intelligence should be very rare, on the grounds that there are a billion ways for life to become successful without becoming intelligent (all far easier to do than for life to become intelligent). In this essay, Sagan said, “When we do the arithmetic, the number that my colleagues and I come up with is around a million technical civilizations in our Galaxy alone.” The statement is nonsensical. First, it implies a consensus on the topic, when no such consensus ever existed, with estimates of the number of extraterrestrial civilizations in our galaxy ranging from 0 to a billion. Second, there was never a sound basis for drawing such a conclusion. Suppose we calculate the odds based on the difficulties of a chance appearance of the most simple type of life (requiring cells, DNA, a genetic code, and many types of proteins, which are each exceedingly unlikely to appear by chance), without assuming some special cosmic teleology that might improve the odds. Then the answer you get is that we should expect no other life form to have arisen anywhere else in the galaxy. That's not even considering the difficulties of intelligence appearing after life has appeared. A very strong argument can actually be made that when estimating the number of extraterrestrial civilizations in our galaxy, it makes no sense to make intermediate estimates such as Sagan's (by intermediate estimates I mean those which estimate a number of civilizations in our galaxy greater than 100 but less than a billion). The argument has to do with interstellar colonization. Suppose there were, say, 100,000 extraterrestrial civilizations that independently arose on other planets in our galaxy. 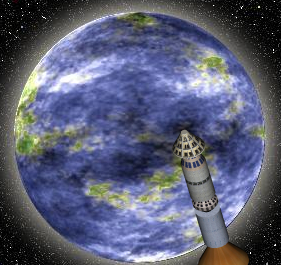 Even assuming very slow interstellar travel, there would have been abundant time (more than a billion years) for interstellar colonization, in which many times a civilization spreads out to colonize nearby solar systems. So within 100 million years or a billion years, an original population of 100,000 civilizations on 100,000 planets should inevitably expand out to inhabit billions of planets. The same thing should happen even if there were only 1000 extraterrestrial civilizations. So based on interstellar colonization considerations, it seems that it makes no sense to estimate that there exist something like a million civilizations in the galaxy. But such a consideration does not rule out a much higher estimate, that there might be billions of planets inhabited in our galaxy. The previously discussed results of the Search for Extraterrestrial Intelligence (SETI) suggest that Sagan's estimates about the number of extraterrestrial civilizations in our galaxy were way off the mark. They suggest that our galaxy does not seem to be teeming with a million or so extraterrestrial civilizations as Sagan imagined. The very strong evidence for psychic phenomena (such as I discussed here, here, here, and here) suggest that Sagan was also dead wrong about paranormal phenomena, which he attacked in his book The Demon Haunted World. Carl Sagan was a pleasant, sincere fellow who did lots of good work, but it seems that we don't live in a Carl Sagan universe. One of the more dubious things Sagan did was to get NASA to put information disks in the two Voyager spacecraft. Sagan chaired a committee that took almost a year to select the contents of the disks. The idea was that the disks would be a record of human activities that might be picked up in the distant future by some extraterrestrial civilization when the Voyager spacecraft left the solar system after exploring Jupiter and Saturn. If our sun were the size of a grapefruit, the nearest star would be 2500 miles away. Given the incredible vastness of interstellar space, the chance that either Voyager spacecraft will be picked up by an extraterrestrial civilization is basically zero. So spending lots of time preparing such a disk for the Voyager spacecraft was a silly idea (conversely, putting such a disk on one of the Apollo lunar landing vehicles would have made sense, for there would have been a reasonable chance of discovery by extraterrestrial visitors in the distant future). But NASA went along with the Voyager disks idea, because Carl Sagan was pitching it. When you're a celebrity scientist, it's almost like you are some Svengali or Pied Piper who can get people to believe in something you sell, even if it makes no sense.